Speech Sound Development Chart for Articulation GFTA3, new norms as of 2015 for both males and females. Included consonant clusters. 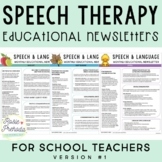 This simple and attractive speech sound chart can be printed as a helpful reference for SLPs or as a handout for parents. 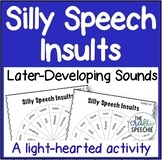 It has been adapted from Sanders (1972) and shows the range of ages that each speech sound can be learned at. I compiled this speech development chart from different sources. This can be used as a handout to parents and teachers. Many times, a child's speech distortion can be age-appropriate or misdiagnosed. 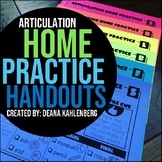 Get your FREE copy here! Use this chart as a quick reference for speech sound development for boys. Organized by age, it is easy to identify if your student or client is typically developing or delayed! Download this freebie now and browse our page to find more useful resources for your therapy needs! 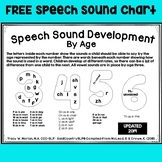 Speech sound development chart with norms for both males and females. Easy to use, quick reference guide, and a great visual to give to parents, teachers, etc. This is a simple, one page visual aid showing the appropriate age of sound acquisition. Color and B&W. Easy to use as poster or to hand out to teachers for reference. Children PLAY with sounds in Teddy's latest learning adventure! These innovative, interactive printable Teddies support: . phoneme identity activities . individual sounds for repetition . syllable production (CV, VC, CVC, etc.) . phonemic awareness: blend, substitute, delete, etc. .
You can use the chart below as a general guide to help you see at what age certain consonant sounds develop. This chart is the perfect quick reference to help you remember the age at which sounds develop for any student, in the off chance you don't remember.